A sauna on its own does the trick, but there are lots of accessories available that help to enhance the sauna experience. Below are 8 of the best sauna accessories you should consider buying if you’re the lucky owner of a sauna or steam room. A sauna thermometer is very important because you need to make sure the sauna doesn’t get too hot. Similarly, you will also want to make sure the temperature doesn’t stay below the desired temperature for too long. It’s important to purchase a thermometer that is actually designed for a sauna. It needs to be built with the right materials so that is able to withstand the high temperatures inside a sauna. Some thermometers come combined with a hygrometer which measures the humidity and water vapor in the sauna. Pouring water over sauna rocks not only creates a pleasant wave of steam, it also helps to heat up the room a bit quicker. A purpose-built sauna bucket is therefore essential to have present in your sauna, rather than using a simple bottle of water. In addition, a quality sauna bucket is able to deal with the high temperatures inside the sauna and will last a very long time. If you have a sauna at home or you are about to buy a new one, it’s important to think about what kind of sauna rocks you should use for your particular sauna. There are different types of sauna rocks and stones and some are better than others, size is an important factor too. Good sauna rocks should be able to create and maintain heat properly. 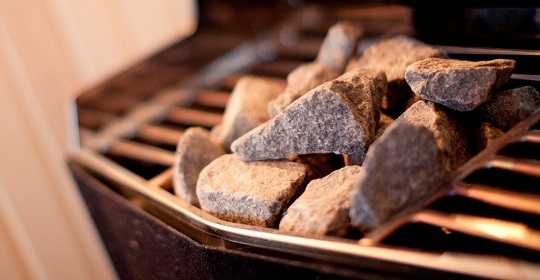 Please read our extensive guide to sauna rocks to help you find the best ones for your sauna. Some might say this is a luxury item, but a well designed sauna backrest does actually improve the sauna experience significantly. A lot of people tend to become somewhat restless, bored if you like, when sitting in a sauna for a while. The sauna’s bench typically isn’t super ergonomic which also triggers the restlessness. A quality backrest is designed such that it fits the natural arch in your back, creating a very comfortable seating position. Certain smells can have a positive impact on our state of mind. The smell of eucalyptus oil is particularly effective when it comes to creating a relaxing effect. There are various ways to enjoy the small of eucalyptus oil during a sauna session. You can use a dispenser, which will spray the oil into the air. You can also add a few drops to some water before pouring it over the rocks. Or you can also spray the oil directly on the rocks. If you’re looking to also improve your skin during a sauna session, a sauna brush is what you will love. 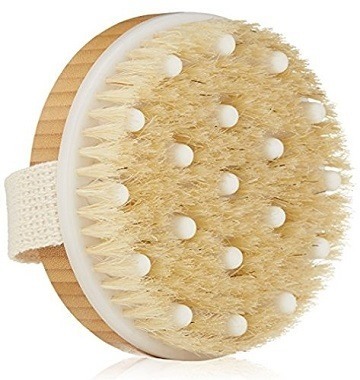 The natural bristles of a sauna brush are perfect for gently scrubbing wet skin. They remove dead bits and also make your skin feel and look more smooth, if used properly and regularly. A good sauna brush will also promote improved blood circulation and can even help to reduce cellulite. Similar to how a backrest adds more comfort, a seat cushion serves a similar purpose. Sauna benches are typically made with hard wood and are not always the most comfortable. A sauna seat cushion does provide that extra comfort that some of us need when sitting on a bench for a longer period of time. Made with durable polyester fabric, a good sauna seat is filled with moisture resistant foam. The cover has a zipper and is washable. A body wrap is essentially a big towel that fits nicely around the body. They are comfortable and easy to wear, and can also be used for other purposes such as gym and pool visits. Since a body wrap will absorb a lot of sweat, it’s crucial to choose a durable one that will last long without suffering stains and unpleasant smells. Save my name, email and website in this browser for next time I comment.